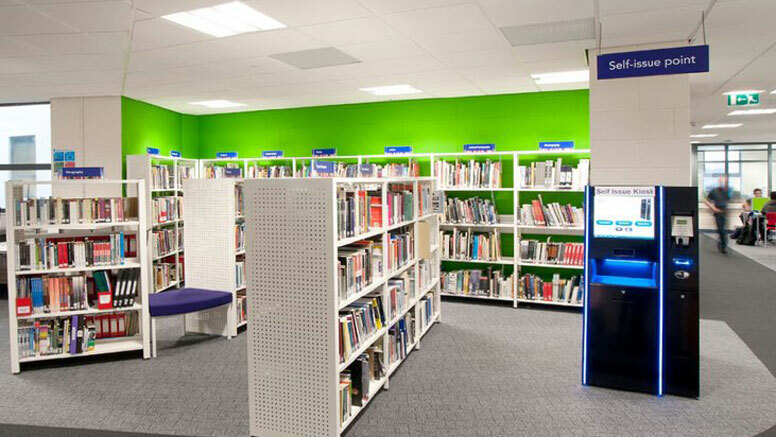 A college library modernisation and transformation project with access to IT provision throughout and clearly identifiable study zones. A sophisticated space that facilitates various learning and study situations for individuals and groups was required. Lines of sight and flow through were a key consideration in the space planning, with furniture design and the use of colour being integral to the entire scheme. A flexible layout was planned that enabled access to IT provision throughout and clearly identifiable study zones. The library entrance features a 6 position ‘Quick IT’ facility with poser height perimeter benching and stools. The ‘Quiet’ study area features perimeter benching with saw tooth extensions to increase the study desk area. The main study zone encourages active study, the bold white and red bespoke reception desk is located in the centre of the ‘L’ shaped library to enhance visibility and service provision. White Latitude library shelving with perforated steel end panels give this section of the library a clean and stylish feel. Further interest is created with the use of soft seating pads positioned at an angle between bays to create a curved effect which adds light. The shelving is strategically positioned to improve flow through, give clear lines of sight and create light and shape throughout. Freedom display units showcase journals and study desks are set up for group study. Also in this area is the careers desk and three further bays of white Latitude library shelving, featuring red back panels to define the area and attract attention.